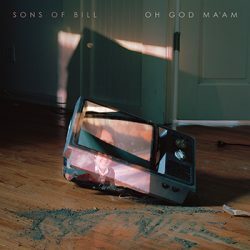 It’s been almost 4 years since we had an album release from Sons of Bill and it’s fair to say that the Wilson brothers, Sam, Abe and James haven’t let the grass grow under their feet. Their new offering ‘Oh God Ma’am’ sees them move away from their Virginia/Appalachian roots into a more Indie sound that at times is reminiscent (to this reviewer at least) of bands like Travis, especially on tracks like ‘Believer/Pretender’ and ‘Where we Stand’ (admittedly that’s a bit of a tenuous comparison as I’m pretty sure the Glasgow rockers never sung about the inspiring openness and greenery of Virginia, but you get the drift – hopefully!). The album starts with the haunting ‘Sweeter, Sadder, Farther Away’, a story of unrequited love that ends in tragedy – or does it? The highly ambiguous lyrics leave the listener guessing and indeed allows the opportunity to mentally create the ending that feels right for you. If after listening to this opening track you were wondering what happened to the Sons of Bill who debuted with a ‘A Far Cry From Freedom’ in 2006 and who at that point could have been mistaken for second cousins of The Eagles, it would be a pretty good question. The music on this album is unrecognisable from that produced on their debut album from twelve years ago. It’s deeper and darker with an entirely different sound, but that’s no bad thing as the band continue to explore and to further develop their own identity. Given the album was recorded partly in Seattle with Phil Ek (Shins, Fleet Foxes) and in Nashville with Sean Sullivan (Sturgill Simpson) and ultimately mixed by Peter Katis (The National) it shouldn’t be a huge surprise that the whole package has a complex Indie/Americana vibe that is almost impossible to categorise but which is highly enjoyable nonetheless. This is not a band who have reached this point in their careers easily. Since winning a battle of the bands event in 2005 that led to free studio time to help record their initial album, they have been beset by a series of challenging personal events that include divorce, addiction, mental illness and even a comi-tragic drama that ended in youngest brother James severing tendons and a nerve in his right hand, threatening his ability to play guitar. Thankfully he is slowly recovering although playing acoustic is still a challenge. Standout tracks on the album include ‘Good Mourning’ and the more contemplative ‘Old and Gray‘ but this is not a piece of work that can be described by reviewing or attempting to describe the individual tracks, it is best viewed in it’s entirety, as a more adventurous Sons of Bill strive to create their own identity and to shake off the demons created by three years on the road following the success of their 2014 efforts ‘Love and Logic‘. ‘Oh God Ma’am’ is definitely different to anything they have done before and the Wilson brothers along with bassist Seth Green and drummer/percussionist Todd Wellons have created an album they are rightly proud of and which is definitely worth seeking out. An intriguing and enjoyable change of direction for the Virginian brothers.